There are events that nobody wants to miss and the Tokyo Grand Slam is one of those. Winning a medal here in Japan, where judo was invented in 1882 by Jigoro Kano, has always had a special taste and it is the dream of every top level judoka to step on the podium of the Tokyo Metropolitan Gymnasium. The 2016 edition of the Grand Slam is even more special as it is the very last event of the season, which shone brightly with the Rio Olympic Games a few months ago. Thus several Olympic medallists made their comeback here in Tokyo after their last summer’s performance. A new generation of champions is also rising and boldly trying to access the top place of the tournament to gain precious points for a better world ranking position. But coming back to Tokyo has also a special flavour this year and the years to come since the next Olympic Games will be held in the city in 2020 as well as the 2019 World Championships. On the occasion of this first day of competition at the Tokyo Grand Slam 2016, the IOC Coordination Commission of the Tokyo 2020 Olympic Games paid an important visit to the Tokyo Metropolitan Gymnasium and enjoyed the beautiful judo displayed on the tatami. 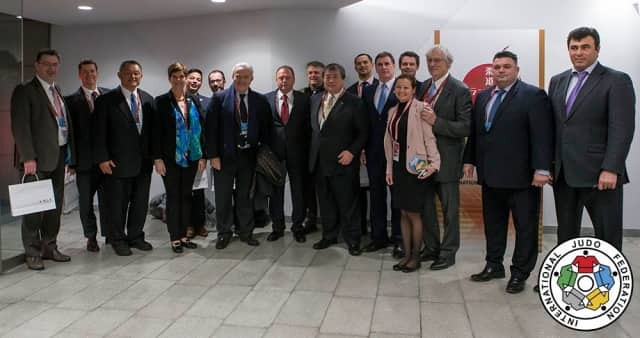 The delegation was composed of: Alex GILADY (IOC Member), Francesco RICCI BITTI (ASOIF member), Habu Ahmed GUMEL (IOC Member), Nicole HOEVERTSZ (IOC Member), Irena SZEWINSKA (IOC Member), Andrew PARSONS (COCOM Member), Andrew RYAN (ASOIF member), and Kit McCONNELL (IOC Director). 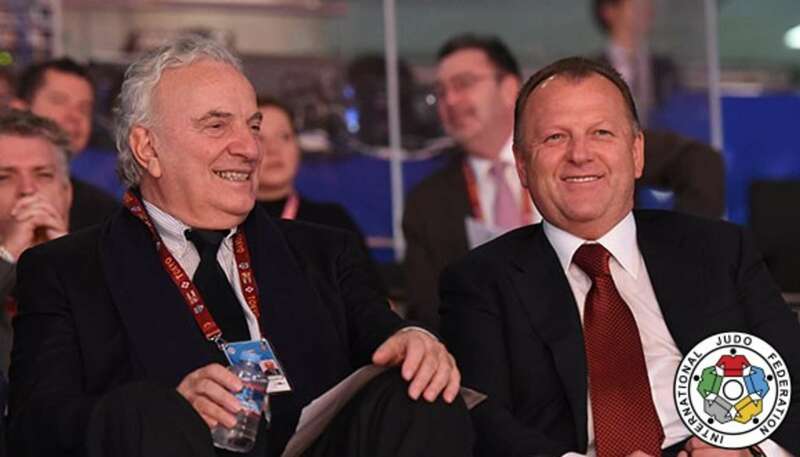 The Coordination Commission was welcomed by the International Judo Federation President, Mr. Marius Vizer. I am very impressed by the universality of judo. Of course Japan is very strong and especially in their country, but there are many other countries on the podium. The organisation is very good and judo is regularly progressing. 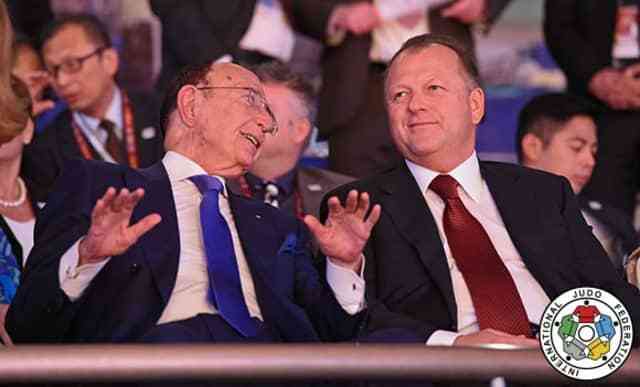 Our responsibility is to promote judo worldwide and to offer it to the next generations. It’s really an honour to see that judo has spread on all continents and for us it is really important that our sport spreads properly. 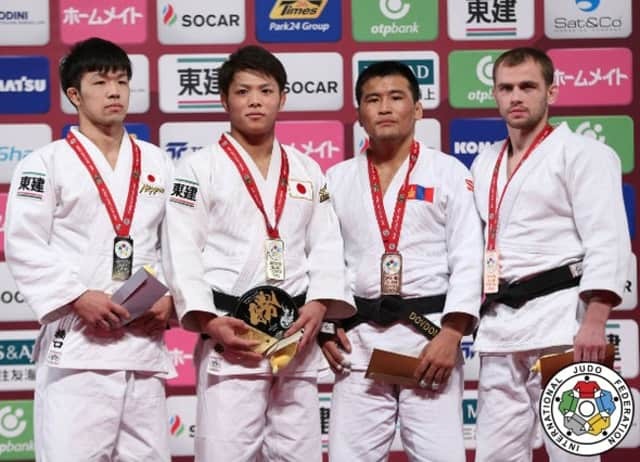 Tyumen Grand Slam winner ABE Hifumi won -66kg gold while his younger sister took -52kg silver as four of the five finals on day one were all-Japanese contests. The hosts are already out of sight at the top of the medal table with four gold, four silver and five bronze medals. 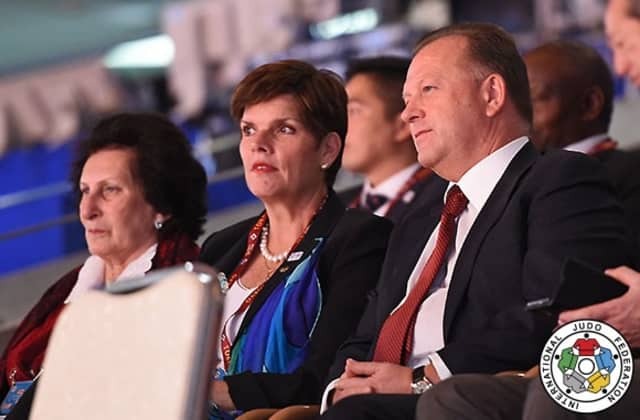 Mongolia are second after the first day with one gold medal and two bronze medals with South Korea in third place having earned one silver and one bronze medal. The season-ending Tokyo Grand Slam 2016 continues on Saturday with four weight categories set the contested as the men’s -73kg and -81kg categories and the women’s -63kg and -70kg categories will be settled. Rio 2016 Olympic champion Tina TRSTENJAK (SLO) returns to IJF duty on Saturday but will have four Japanese judoka among those with the goal of defeating the second person to wear the new gold backpatch at Toyo 2016. Former world champion MUNKHBAT Urantsetseg (MGL) ousted Rio 2016 Olympic silver medallist JEONG Bo-Kyeong (KOR) to win her first event outside her homeland in 2016. 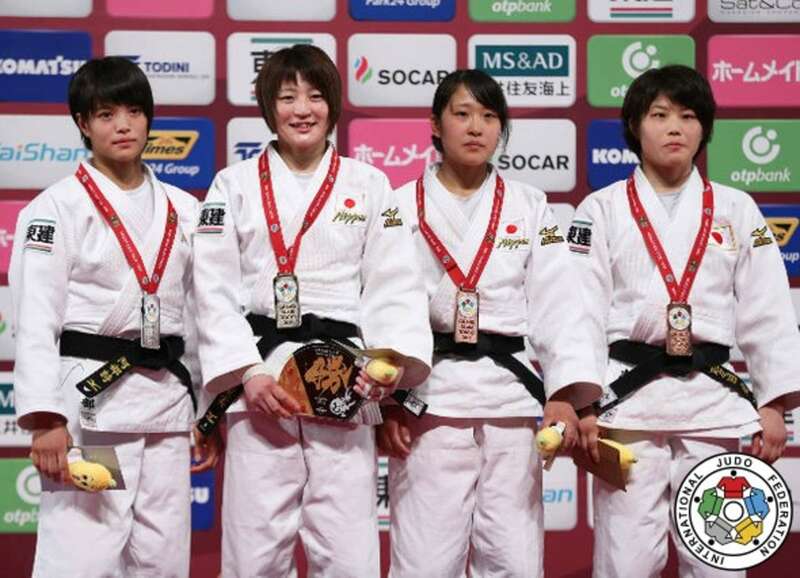 The -48kg category was the only one out of the five contested on day one which did not feature a Japanese finalist. While there was not Japanese representation, the first final of the competition was still an all-Asian affair. Ulaanbaatar Grand Prix winner MUNKHBAT won her fourth Grand Slam gold medal on shido penalties 1:2 as JEONG was twice reprimanded for being passive. In the first semi-final Rio 2016 Olympic bronze medallist Otgontsetseg GALBADRAKH (KAZ) fell to JEONG who dictated the pace of the contest and offered the greater attacking threat. The Asian rivals were all-square after four scoreless minutes and golden score was required to produce a finalist. After an additional one minute and 48 seconds the South Korean fighter caught GALBADRAKH with ashi-waza for a yuko score and a place in the gold medal contest. In the second semi-final Tyumen Grand Slam winner TONAKI Funa (JPN), who defeated teammate and Rio 2016 Olympic bronze medallist KONDO Ami (JPN) in their quarter-final by ippon in golden score with a tani-otoshi, narrowly lost out to MUNKHBAT. A shido against the young Japanese judoka settled the scoreless contest as the experienced Mongolian prevailed. The first bronze medal contest was clinched by TONAKI who pipped Budapest Grand Prix winner ENDO Hiromi (JPN) to the podium. Pocked-sized TONAKI and ENDO, one of the tallest judoka in this weight category, cancelled each other out in regular time and had to go golden score to determine a winner. The opening contest of the final block was a key domestic clash as not only did it earn the winner a Grand Slam medal but by beating a teammate the result will impact international selections for 2017 as both chase a spot at the 2017 World Championships in Budapest, Hungary. TONAKI came away with the medal as ENDO was penalised with a shido after 40 seconds. The second bronze medal was won by Rio 2016 Olympic bronze medallist KONDO Ami (JPN) who turned the contest on its head in the last 25 seconds to beat GALBADRAKH. The latter led with a yuko and defended a juji-gatame attempt from KONDO as she looked on course for the podium. However, with 25 seconds left KONDO was generating one-way traffic and sent the Kazakh over with a ouchi-gari for a yuko. GALBADRAKH had already received a shido and that error ensured that KONDO compelted a dramatic comeback to match the result of TONAKI Funa. Kodokan Cup winner TSUNODA Natsumi (JPN) won gold on her IJF debut as she defeated teenage starlet ABE Uta (JPN) in the -52kg final. TSUNODA, 24, faced ABE, 16, in the gold medal contest as two new names came to the fore in Tokyo. The former fought her way to the top of the podium as she tapped out the teenage sister of ABU Hifumi with a juji-gatame. In the first semi-final Tyumen Grand Slam winner SHISHIME Ai (JPN) fell to Kodokan Cup winner TSUNODA Natsumi (JPN). The IJF World Judo Tour debutant opened the scoring with a yuko from a seoi-nage off to the side before submitting her countrywoman with a juji-gatame. In the second semi-final 16-year-old IJF World Judo Tour debutant ABE Uta (JPN) defeated 20-year-old former Cadet World Championships bronze medallist TATSUKAWA Rina (JPN) with an emphatic osoto-gari for ippon. The first bronze medal was won by TATSUKAWA who marked her first appearance on the IJF World Judo Tour by taking the scalp of -52kg newcomer Charline VAN SNICK (BEL). TATSUKAWA attacked early with an uchi-mata and her volume of work exceeded that of her Belgian opponent who was penalised for passivity and that determined the winner after the four minutes elapsed. 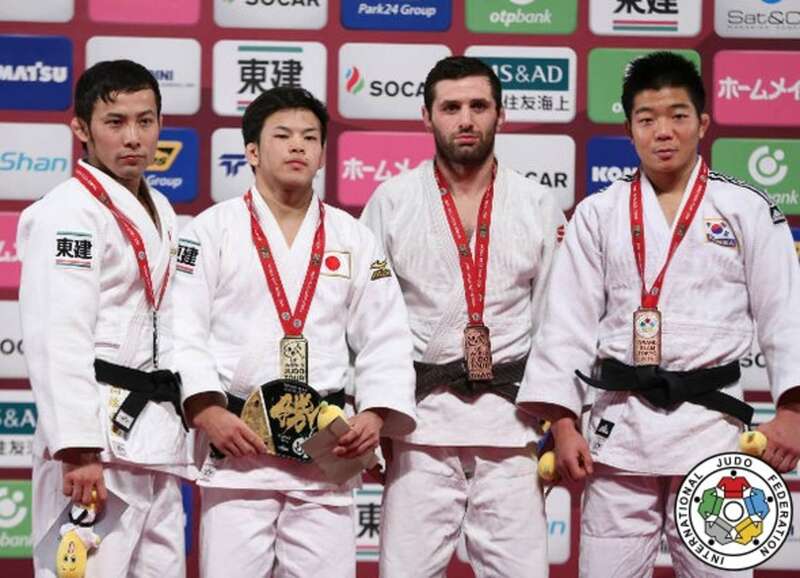 The second bronze medal was won by SHISHIME who held down Tashkent Grand Prix silver medallist Diyora KELDIYOROVA (UZB) in osaekomi for 20 seconds as Japan kept both bronze medals in Tokyo. YOSHIDA Tsukasa (JPN) retained her Tokyo Grand Slam title with a win against former world champion UDAKA Nae (JPN) to capture her fifth Grand Slam gold medal after a lung-busting 11 minute final. YOSHIDA, who is still only 21, opposed 2014 world champion UDAKA, who was followed a year later by 2012 Olympic champion MATSUMOTO Kaori (JPN). After six energy-sapping yet engrossing minutes of added time UDAKA was penalised for passivity as the younger fighter struck home hold one more time. In the first semi-final Rio 2016 Olympic silver medallist DORJSUREN Sumiya (MGL) was beaten by YOSHIDA who registered a full house of scores. The home fighter scored a waza-ari with a osoto-gari before topping up the scoreboard with a yuko and then put the Mongolian top seed out of her misery by submitting her with a juji-gatame. In the second semi-final Budapest Grand Prix winner TAMAOKI Momo (JPN) succumbed to the animated UDAKA who roared with victory as after throwing her compatriot by ippon with a tai-otoshi. 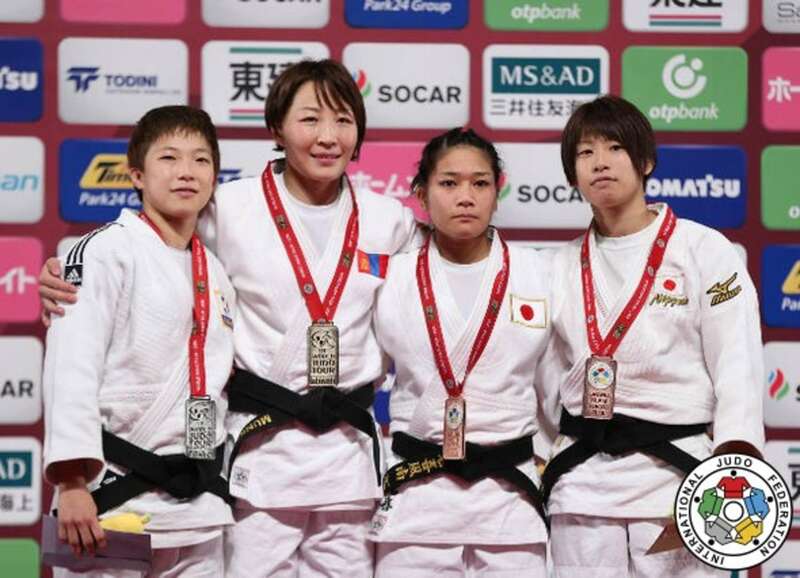 The first bronze medal was won by TAMAOKI over Ulaanbaatar Grand Prix silver medallist ISHIKAWA Megumi (JPN). 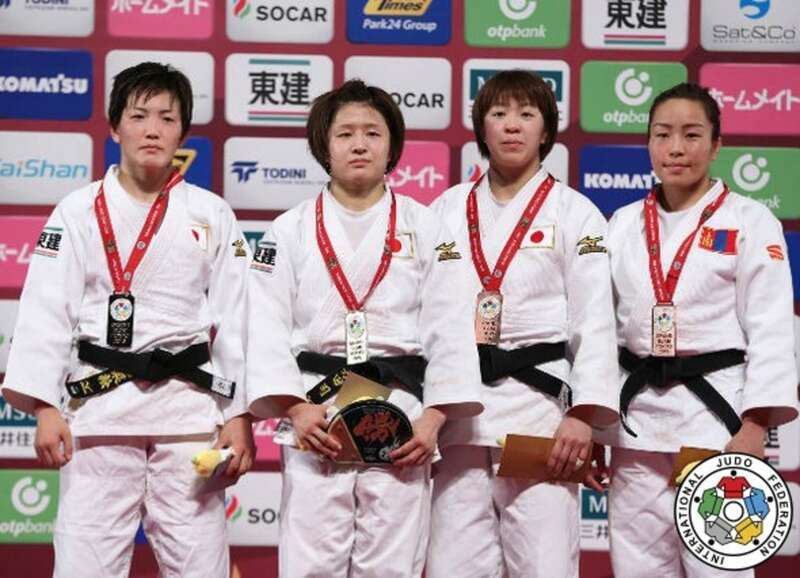 Ne-waza master ISHIKAWA wanted to take the contest to the ground at every opportunity but TAMAOKI was not playing that game and established her own rhythm a she won a crucial medal to keep her name in the domestic discussion at -57kg. After two minutes of golden score ISHIKAWA was guilty of being passive and was promptly penalised to send her colleague onto the medal podium. The second bronze medal was won by DORJSUREN who extended her one-sided head-to-head lead over Abu Dhabi Grand Slam winner Helene RECEVEAUX (FRA) to 6:1. DORJSUREN looked a spent force in the last 60 seconds but had the resolve to protect her slender yuko advantage and see out the closing stage of the four minute contest. Junior world champion NAGAYAMA Ryuju (JPN) shocked Rio 2016 Olympic bronze medallist TAKATO Naohisa (JPN) to win -60kg gold on day one in Tokyo. The teammates who train together every day at Tokai University met in one of Japan’s four finals as NAGAYAMA threw spectacularly with an uchi-mata for ippon with 44 seconds remaining as he lifted up TAKATO from his knees and over onto this back. The silver medallist gave NAGAYAMA a pat on his back after the contested was awarded and both judoka will be in contention in 2017 on the IJF World Judo Tour. In the first semi-final Junior world champion NAGAYAMA Ryuju (JPN) controlled London 2012 Olympic bronze medallist Felipe KITADAI (BRA) for all five minutes. NAGAYAMA scored two yukos without reply and it could have been more as the Brazilian KITADAI was thrown repeatedly as only his acrobatic skills helped him to evade giving away any further scores. The fearless NAGAYAMA moved on to the final while KITADAI turned his attention to a tilt at bronze. In the second semi-final Rio 2016 Olympic bronze medallist TAKATO Naohisa (JPN) defeated Zagreb Grand Prix silver medallist Robert MSHVIDOBADZE (RUS) after two minutes of golden score. The Tokai University judoka showed quick feet to wobble the Russian and followed up with his upper body strength to send MSHVIDOBADZE over for the smallest score and the familiar smile of TAKATO showed his pleasure as he advanced to the final. The first bronze medal was won by MSHVIDOBADZE who threw number one seed DASHDAVAA Amartuvshin (MGL) for the maximum score with a drop seoi-nage in the closing seconds. The Russian fighter led by a waza-ari from a foot sweep and won his second Grand Slam bronze with a powerful shoulder throw on the edge of the tatami to become the first European medallist on day one. The second bronze medal was claimed by former Qingdao Grand Prix winner CHOI In Hyuk (KOR) who beat KITADAI by a yuko to grace a Grand Slam podium for the first time. The South Korean number two, who is behind Rio 2016 Olympian KIM Won-Jin, claimed the contest by a yuko score which was the only time the scoreboard was called into action. Former Youth Olympic Games winner ABE Hifumi was the star of the show in the -66kg category as he defeated former Astana Grand Prix winner HASHIGUCHI Yuuki (JPN) to win gold. ABE, 19, has been deliberately held back as Japan were reluctant to release him full-time on the circuit with 2020 in mind but that will change now. ABE has had to be patient but almost always delivers and his star shone brightest under the neon lights of Tokyo with a magical display which culminated with a beautiful sode-tsurikomi-goshi for a yuko and tai-otoshi for ippon. ABE said: “I always fight for ippon, this is so important to me. I go forward and give everything in every contest. At London 2012 the Japanese men did not win a gold medal and it was important to change that at Rio 2016. We want to show the world that Japanese judo is the best. In the first semi-final former Astana Grand Prix winner HASHIGUCHI Yuuki (JPN) did not have to compete as 2015 Tokyo Grand Slam winner TAKAJO Tomofumi (JPN) was injured and pulled out of their semi-final contest. In the second semi-final 21-year-old Kodokan Cup winner ISODA Norihito (JPN) lost out to wonderkid ABE. A huge seoi-nage gave the Japanese young gun a waza-ari as he beat the conqueror of Olympic champion Fabio BASILE (ITA). The first bronze medal was won by Qingdao Grand Prix bronze medallist DOVDON Altansukh (MGL) who continued his country’s bright start in Tokyo with a win over ISODA. DOVDON, a two-time Grand Slam bronze medallist, came up with the only score of the contest as his sumi-gaeshi yielded a yuko score to deny Japanese rookie ISODA a medal on his inaugural IJF World Judo Tour start. The second bronze medal went to double world silver medallist Mikhail PULIAEV (RUS) as TAKAJO again could not compete having already withdrawn before his semi-final due to injury. Rio 2016 Olympic champion Fabio BASILE (ITA) made a bold choice in deciding to return to action at the Tokyo Grand Slam knowing four Japanese judoka would be among the field. The fact that the Italian is in Japan speaks volumes for his confidence but the 22-year-old was off the pace and was held down by IJF World Judo Tour debutant ISODA for 17 seconds and a waza-ari as he lost his opening contest. Rio 2016 Olympic silver medallist and world champion AN Baul (KOR) also had a day to forget as he lost two consecutive contests to finish a lowly seventh by his standards.